Well, it’s fall again. Back to school. Back to work. Back to the gazillion activities each family member has. To celebrate this exciting time of year of beginnings, I’ve decided to offer my readers another FREE sewing pattern! Hooray! 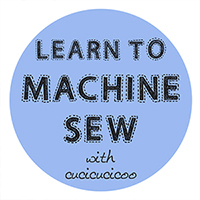 And even better, it’s part of my Learn to Machine Sew series, as the practice tutorial for the lesson on piecing curves together. Yes, I’m talking about a pencil-shaped pencil holder! Kids love these because they’re big enough to put all their school supplies (preferably labeled with the wonderful Sticker Kid labels) in, and also because hey– how fun is it to put pencils inside another pencil? 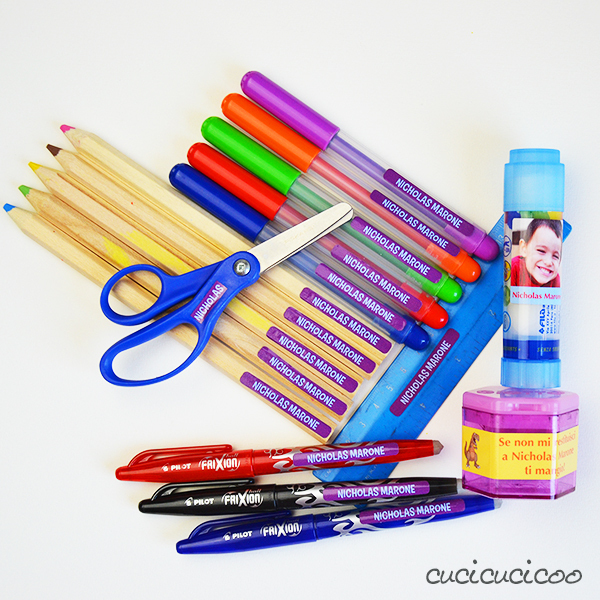 And as a cool optional extra, I’ll show you how to use freezer paper stencilling to customize the pencil case with a name or turn it into the classic #2 pencil that anyone who’s gone to school in the United States knows well! 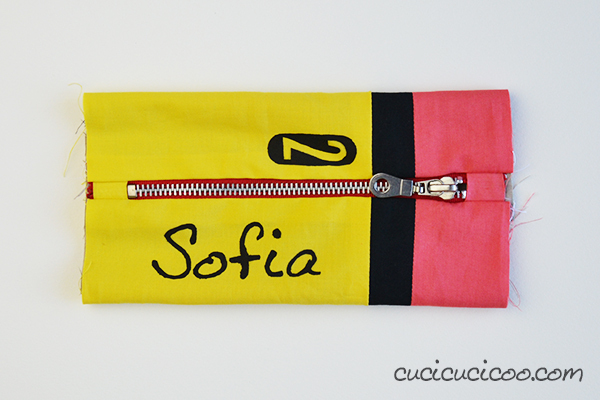 There’s nothing like a fully-lined zipper pouch, right? 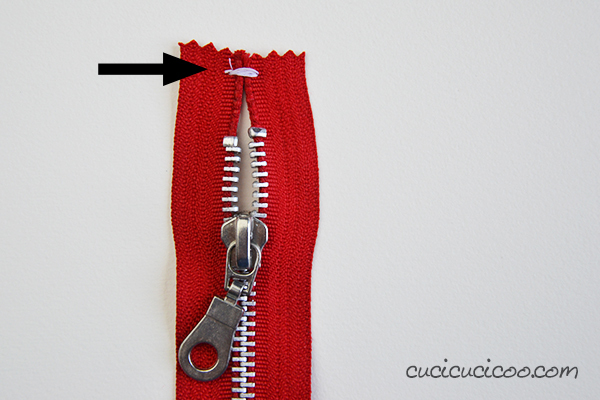 I love how clean it looks inside the zipper. 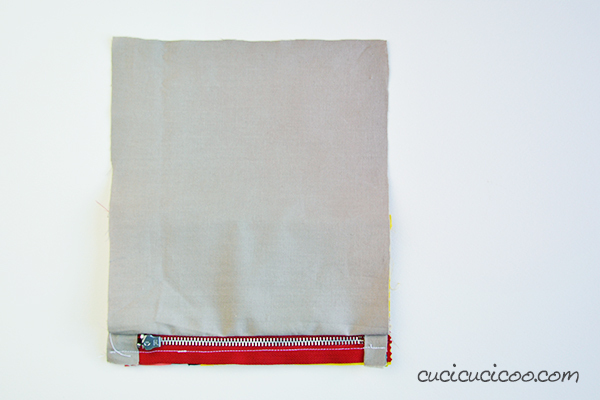 I even show how to add little zipper tabs to hide the end of the zipper tape to let it blend in with the surrounding fabric. So, what are we waiting for? 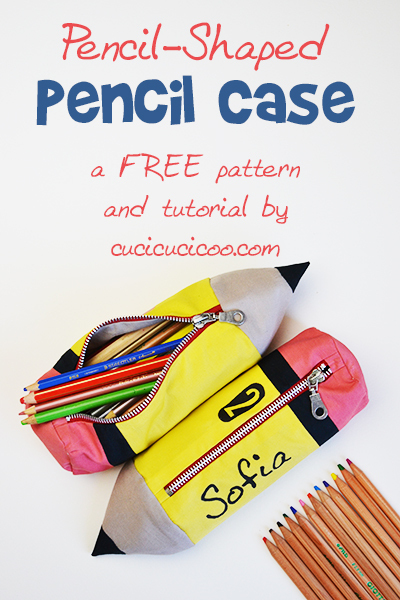 On with the pencil shaped pencil case tutorial! 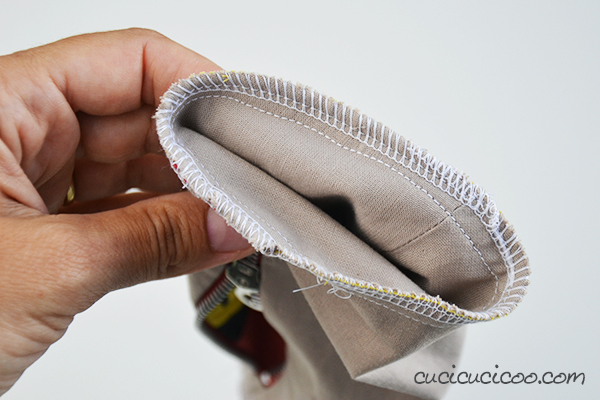 All sewing is done with a 3/8″ (1 cm) seam allowance. 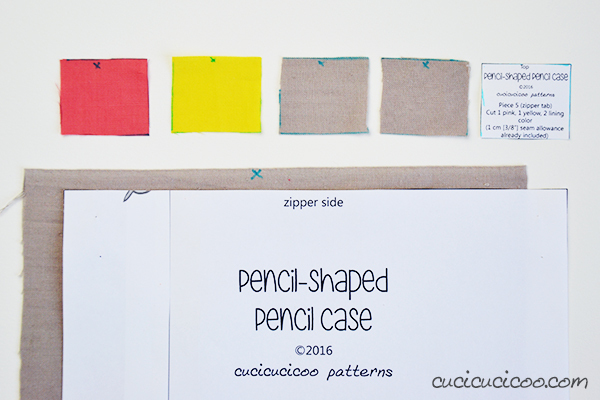 Cut out the number of pieces from each color as indicated on the pattern pieces. As I already mentioned, I used the light brown color also for the lining, and I cut out Piece 8 from black instead of grey. 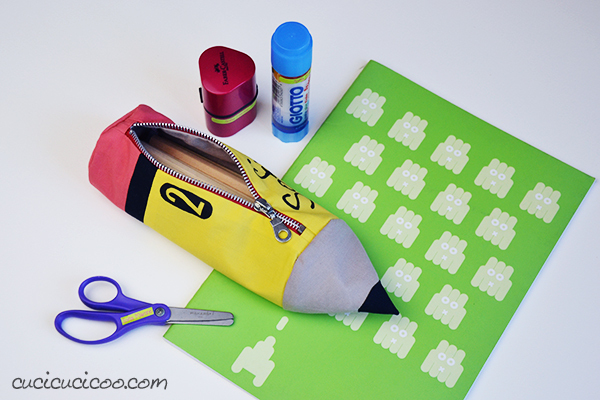 These steps are totally optional, but do add that extra detail that make this pencil pouch so much fun! If you have never freezer paper stencilled before, I highly recommend you first read this tutorial of mine on how to do it. 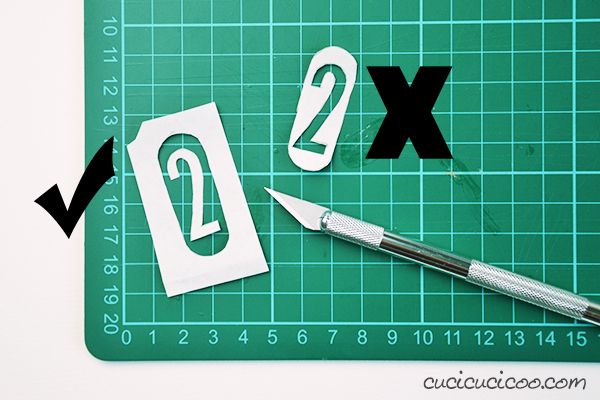 Use the X-acto knife to remove the black inner part inside the oval, but around the number. I’ve marked that part with an X in the image above. Throw that part away. Iron the freezer paper along one short side Piece 6, on the right side of the fabric. 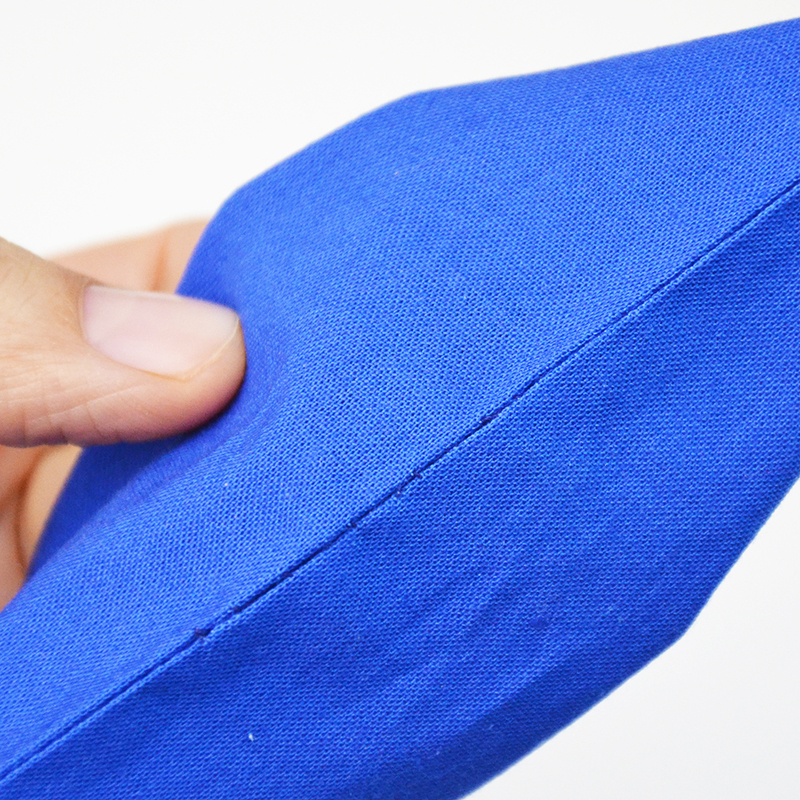 The top edge of the oval should be 2 cm from the edge of the long side of the fabric, and the right edge of the oval should be 2 cm from the short side of the fabric. Use a hot iron with no steam. If you want to add a name stencil, you can draw it freehand on the freezer paper. Or, if you’re not good at that sort of thing, write the name with some computer software in all different fonts to find the one you like the most. 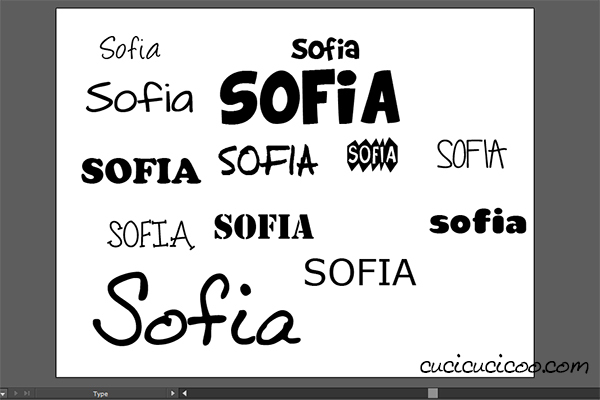 I used Adobe Illustrator to do this, but you could also use Photoshop or any other program that uses fonts. 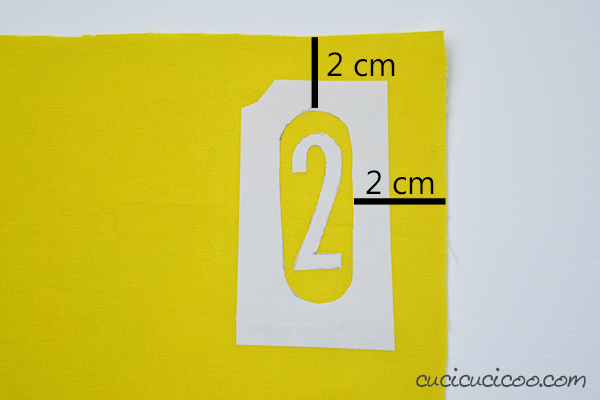 Once you’ve decided which font to use, enlarge it and hold it the fabric up to the screen to check the size. When it’s the size that you like, trace around it with freezer paper directly from the screen (as I explained in this tutorial). Then cut around the whole name and cut out and remove the inside of the letters with the X-acto knife. Iron the name 2 cm from the other short side of Piece 6. Then apply two coats of fabric paint (letting it dry in between), then let it sit overnight before peeling off the paper and heat-setting the paint according to the paint’s instructions. If that’s too much work or takes more time that you have, you could also just quickly apply a Sticker Kid iron-on name label! I really love these labels (read my full review here) and all Cucicucicoo readers can get a 10% discount on all customized stickers, iron-on labels and ID bracelets at Stickerkid.com* with the coupon code “CUCICUCICOO”! Worldwide shipping is super fast, too! This is my favorite part, because the pencil starts really taking shape! Match up one long side of Piece 7 with the other long side of Piece 8, right sides facing. To do this, you have to open up the seam made in the previous step. Iron the seams open from the back of the fabric (picture on top). Flip the fabric over and you’ll see that the pencil is taking shape (bottom)! 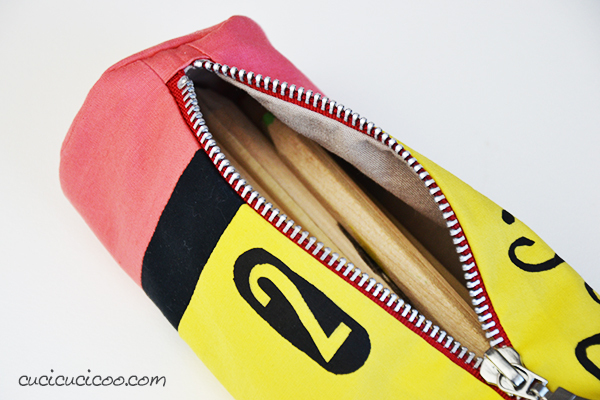 This part really isn’t totally necessary either, but it makes the pencil bag look so much nicer! 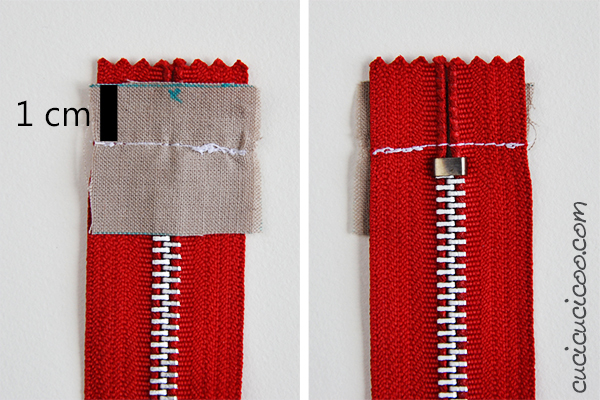 Use a wide zig-zag stitch with 0 stitch length (or as short as possible) to join the two sides of the zipper tape at the top. 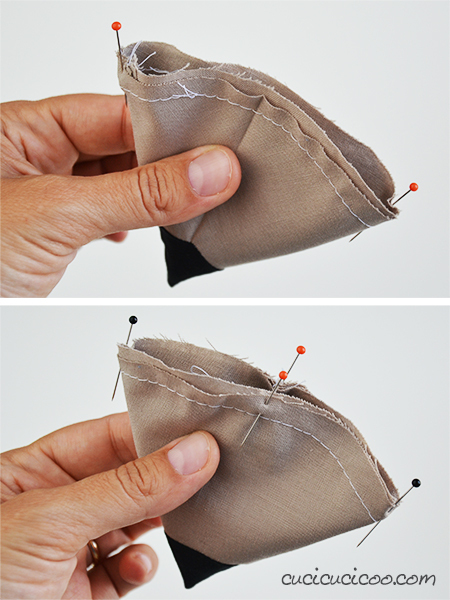 This will make it easier to sew in the next steps. 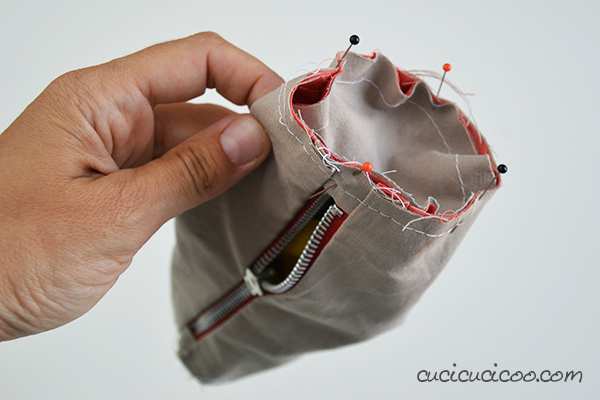 Let’s start at the bottom of the zipper, which is easier to sew than the top! 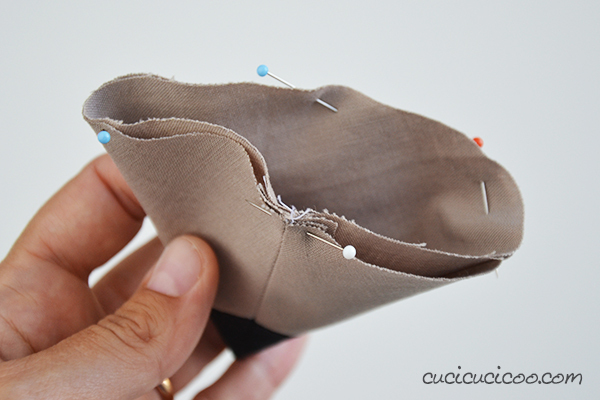 Put the zipper foot on your sewing machine. Place one lining Piece 5 wrong side up on the wrong side of the zipper. The side marked with an X should be positioned 1 cm beyond the bottom zipper stop. Pin and sew in place. 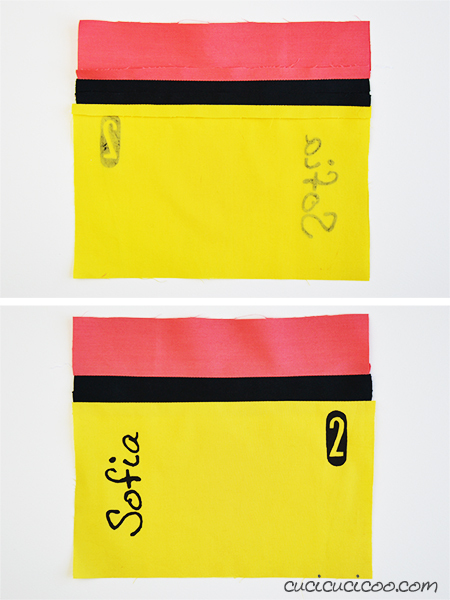 The pictures above show how it should look from the wrong side of the zipper (left) and the right side of the zipper (right). 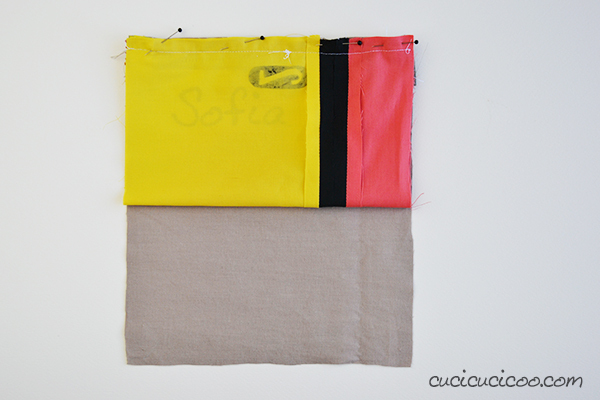 Place the yellow Piece 5 wrong side up on the right side of the zipper. Line it up with the lining Piece 5 on the other side of the zipper tape, again, with the side marked with an X towards the end of the zipper tape. Pin in place and sew from the wrong side of the zipper, sewing on top of the previous stitches, slightly closer to the zipper stop, if possible. This will help hide the previous stitches from the outside. 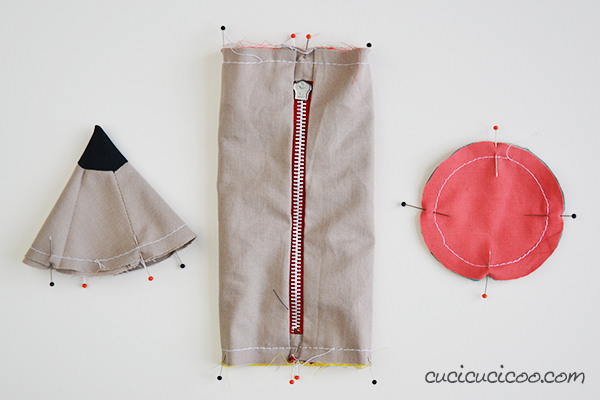 Fold both zipper tabs back and iron them flat (as shown on the right). Now do the same thing on the other end of the zipper, starting from the back with the other lining Piece 5, then finishing on the front with pink Piece 5. Then fold and iron. Mine’s sewn a bit messily here, but it’s no problem! And there’s your zipper with the zipper tabs on it! It doesn’t look so interesting here, but it really makes the pencil pouch look so much more professional afterwards! 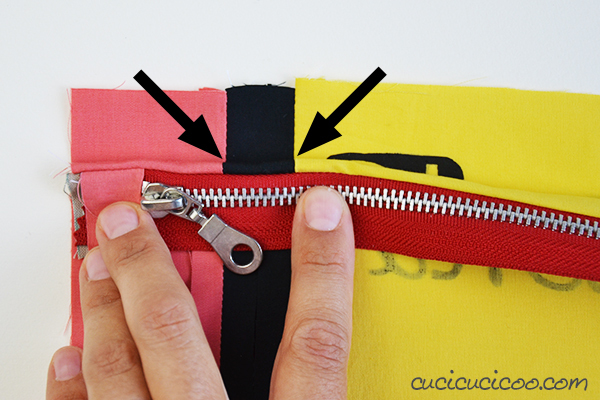 If you don’t have much experience sewing zippers, I highly recommend you first read my zipper sewing lesson and sew the simple zippered pouch to practice zippers before moving on to this slightly more complicated lined zipper technique. Line up one edge of the zipper with one edge of the outer pencil, right sides facing. 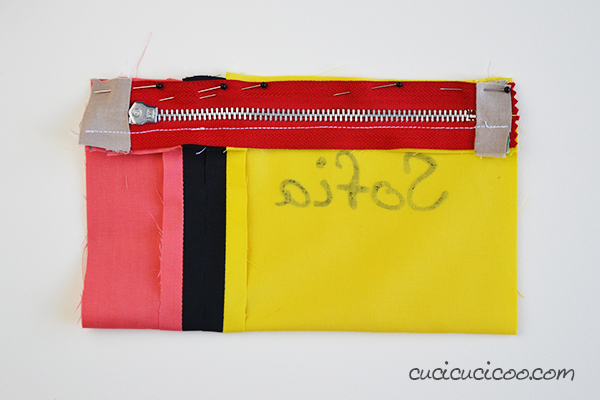 Make sure that the yellow zipper tab is on the yellow side of the pencil and the pink zipper tab is on the pink eraser side. Pin and sew that one side. 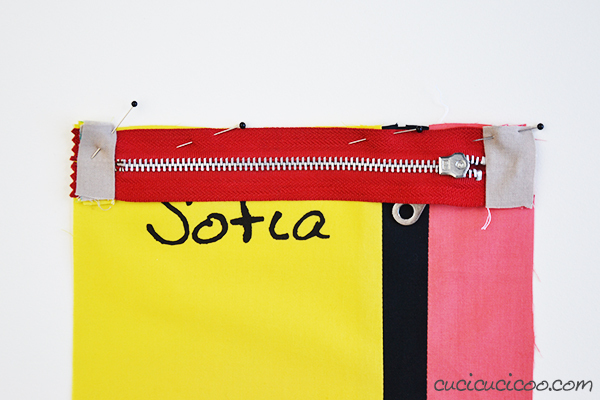 Flip the outer pencil piece so that the zipper is at the bottom and that both the fabric and the zipper are right side up, as seen above. 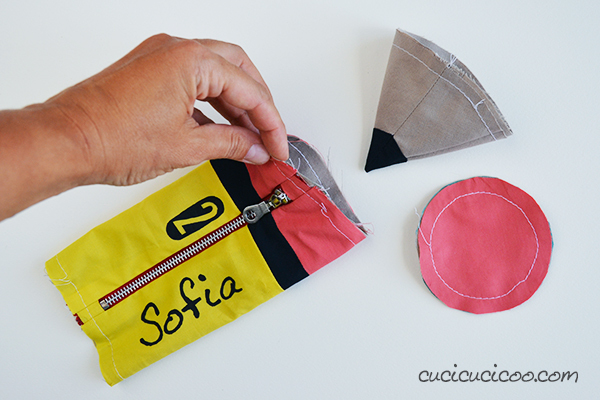 When you are sure that the ferrule edges are lined up and the zipper and fabric edges are lined up, pin the zipper and fabric and sew. Sometimes fabric can slip around while pinning it, so flip open that end up the fabric tube to make sure that the ferrule is nicely matched up. Now let’s add the lining. Lay Piece 9 flat, right side up, with one side marked for the zipper at the top. 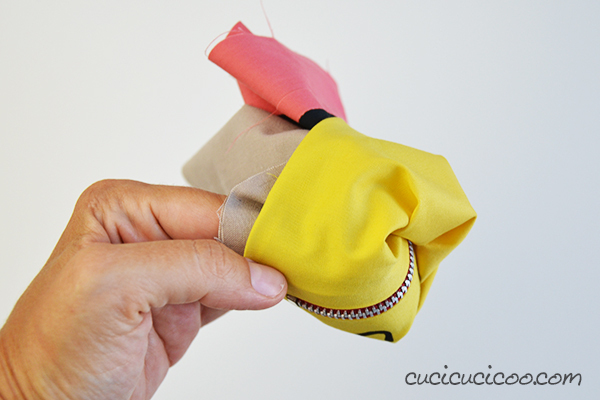 Line up the top edge with one edge of the zipper (it doesn’t matter which), wrong side down. 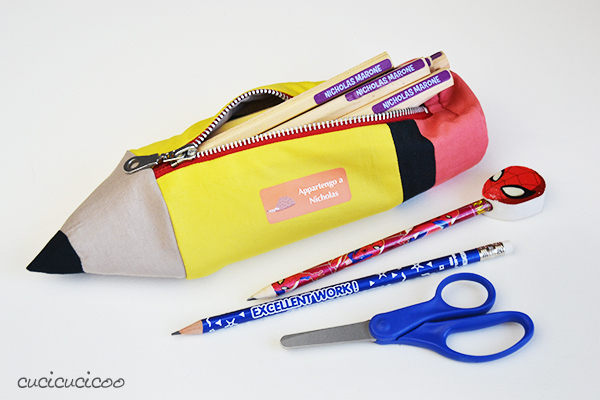 This can be a little confusing at first, because the zipper is obviously already attached to the main pencil body. 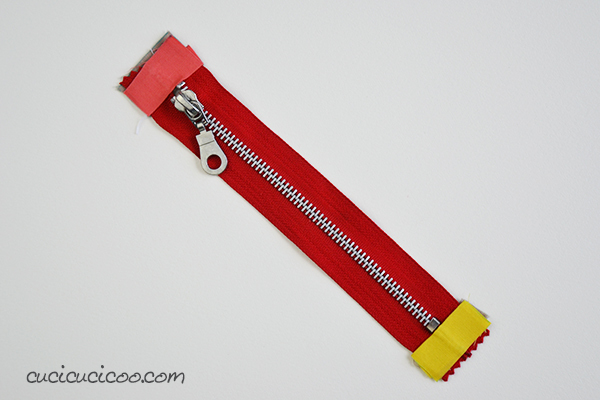 Just keep the pencil fabric tube flat with the zipper flattened underneath (without folding the zipper tape) and with one edge of the zipper at the top. Notice that you can see the stitching holding the fabric to the zipper in the picture above. 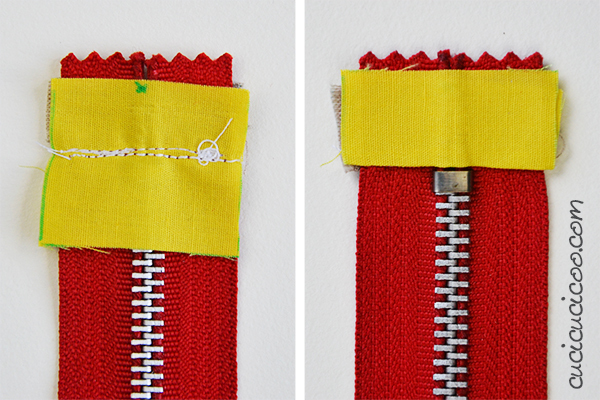 The zipper teeth are just below the stitching, underneath the yellow fabric. 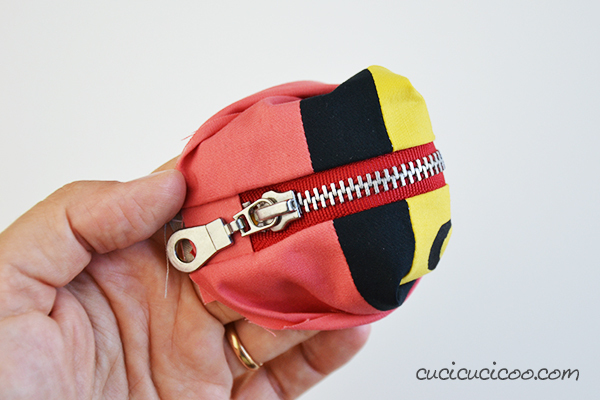 Pin the zipper in place, then sew right on top of that line of stitching, or a little closer to the zipper teeth if possible. Flip the fabric with the zipper at the bottom (wrong side up) and the pencil body fabric beneath the lining (right side up), as seen above. Like we did before, lift the zipper up, folding the lining in half with right sides facing, so that you match up the other zipper edge with the non-sewn lining edge. At this point it is like you have two separate fabric tubes, one on top of the other, with the right sides inside the tubes. 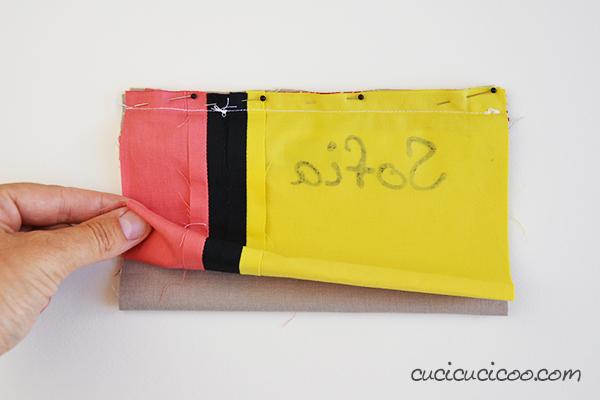 Flip everything right side out through the tube of the outer pencil fabric. And yah! You have a single lined tube that looks like the body of a #2 pencil! 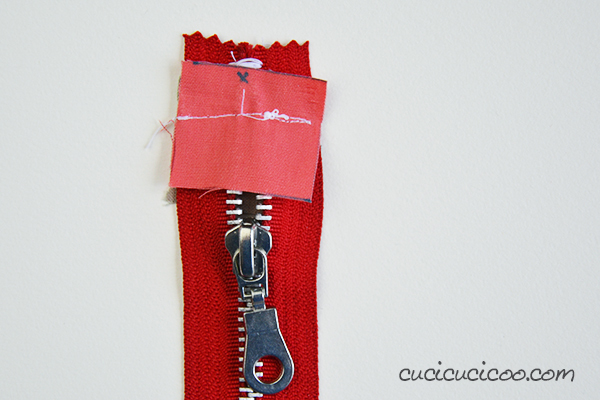 And now you can start to appreciate how good the zipper tabs look! Put this pencil body aside while we work on other parts. 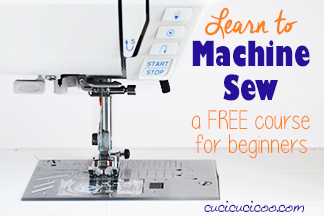 Put your regular sewing machine foot back on and get Pieces 1 and 2. 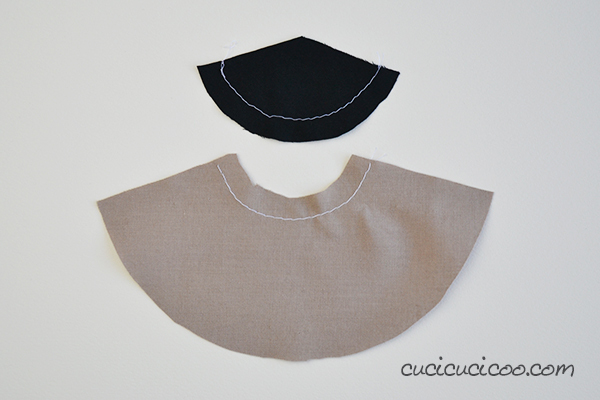 If you have not done so, please read my lesson on sewing concave and convex curves together. As I show in that lesson, the fabric edges along the curves is not the same, but the seam allowances are. So first sew along the curves with a long basting stitch, no backstitching, and a 3/8″ (1 cm) seam allowance, as shown above. 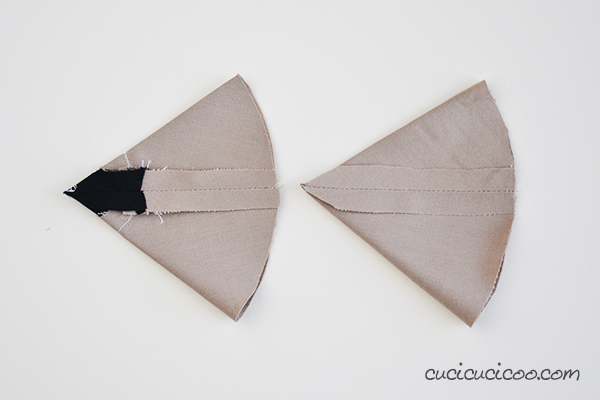 In the sewing curves lesson, the practice pieces had notches to line up. This pattern doesn’t have them, but I’ll show you how easy it is to mark them on symmetrical curves. 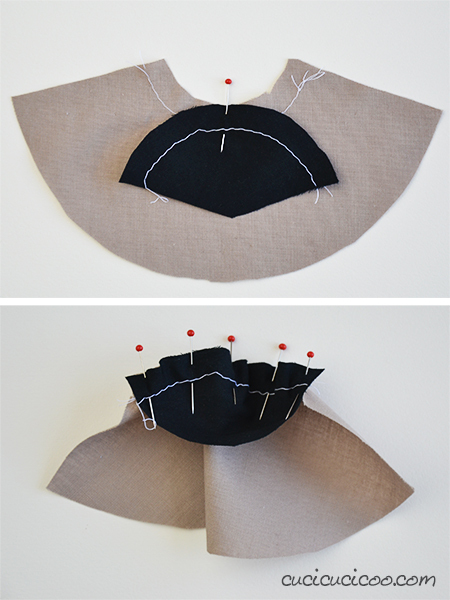 Fold each piece in half and place a pin along the fold where the basting stitches are. There you go– a homemade notch! Do this with both pieces. Then match up each end of the basting stitch (along the straight fabric edges) and pin. Then continue to match the basting stitches between the three pins. 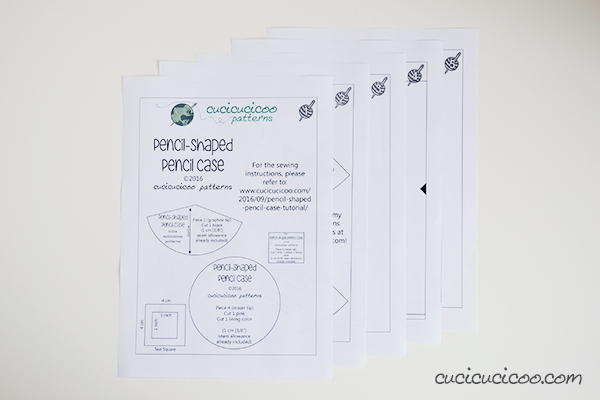 This is exactly like one of the exercises in the sewing concave and convex curves lesson, so if you don’t understand, you can find much more detailed instructions in that lesson. 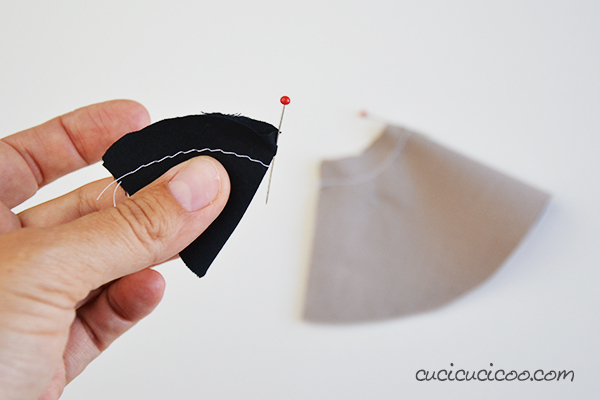 Sew carefully along the pinned curve with a 3/8″ (1 cm) seam allowance, as shown in the curves lesson. Then remove both lines of basting stitches, clip and notch the seam allowance, and iron the seam allowances flat. In this case I actually just left the light brown seam allowance as it was and ironed it over the notched black seam allowance, as seen at the top in the photo above. See your nice curve? 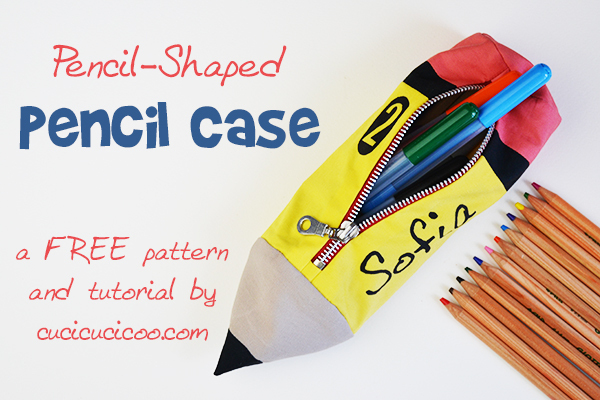 Even if it isn’t absolutely perfectly curved, it’ll still look fine on your finished pencil case, so don’t worry. You can see on the bottom picture that mine isn’t perfect, but you really can’t even tell in the end. Fold both your newly-sewn pencil tip and Piece 3 in half, right sides facing, as shown above. Pin in place and sew down the open straight side. Clip the seam allowances at the point of both pieces and iron the seam allowances open, as shown above. Turn the piece with the black tip right side out and slip the other piece inside of it, wrong sides of the fabrics facing. Gently push the tip of the lining piece as far inside the tip of the outer piece as possible with a chopstich or other blunt tip. Line up the seams, then line up the raw edges of the two cones as best you can (the lining will stick out a little more, but don’t worry about it) and pin them together. 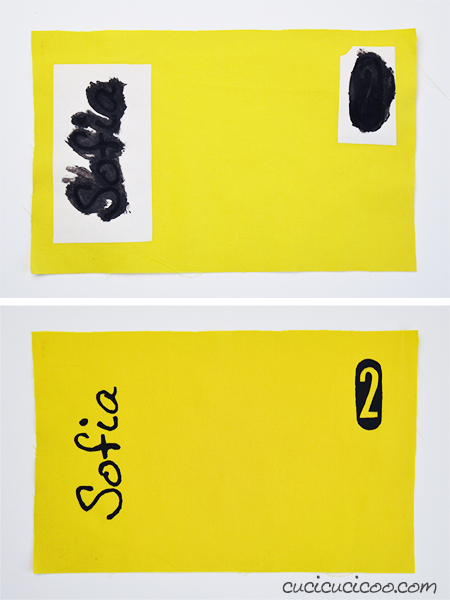 Pin the two Piece 4s together, wrong sides facing. You now have four sets circular raw edges: the two ends of the pencil tube, the pinned outer edge of the pencil tip cone, and the two circles you just pinned together. Sew around all four of these circles with a basting stitch 3/8″ (1 cm) away from the edges, as shown above. Again, there are no notches, so let’s split each circle into fourths to help pin them together. This is the same technique that we used for sewing an exposed elastic waistband. I color-coded my pins to make it easier to match the edges up after, using orange pins for what would become the top and bottom, and the black pins for the sides. 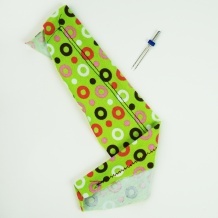 So I was sure to put an orange pin in the seam of the pencil point, and orange pins in the centers of both zipper tabs. It didn’t really matter where the orange pins were for the circles. You can see what I mean in the photo above. Match up the pins of the circles, with the lining facing out, to the end of the tube with the pink fabric, and pin the fabric together just where the pins are. Then pin your way around the circle, matching up the basting stitches as we did before when sewing the pencil tip. 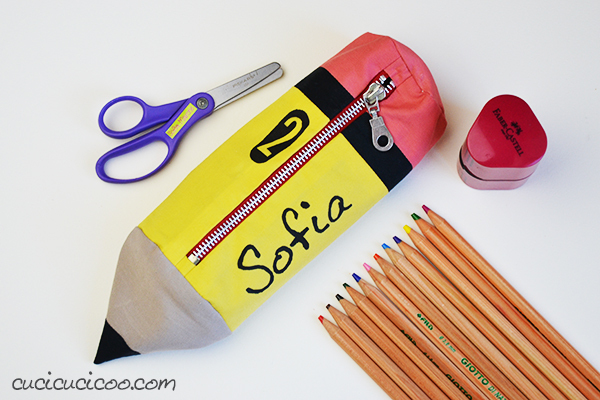 Then stick the pencil tip inside the other end of the tube, so that the black tip is inside and the pencil tip’s seam is positioned opposite the zipper tab (so that it will be at the bottom of the finished pencil case). Again, match up the pins and pin around the entire circle. 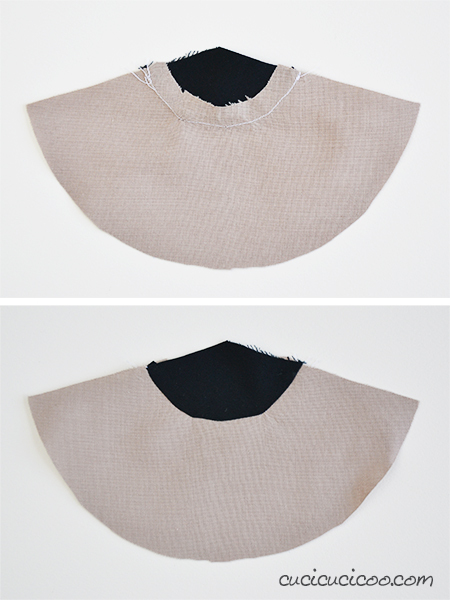 Sew slowly and carefully around both circles with a 3/8″ (1 cm) seam allowance. 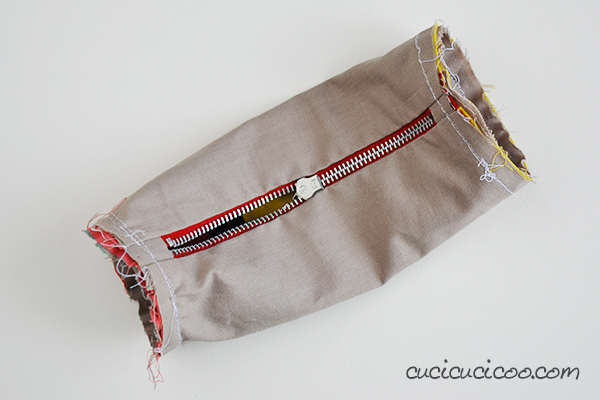 Before removing the basting stitches, I suggest turning the pencil case right side out to make sure that there is no fabric bunching in the permanent seams. After removing the basting stitches, it’s time to clean up those ugly raw edges. 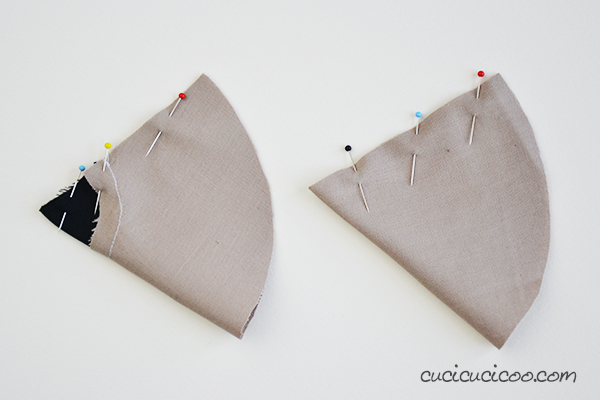 The nicest-looking way to do this is to sew around them with bias tape. 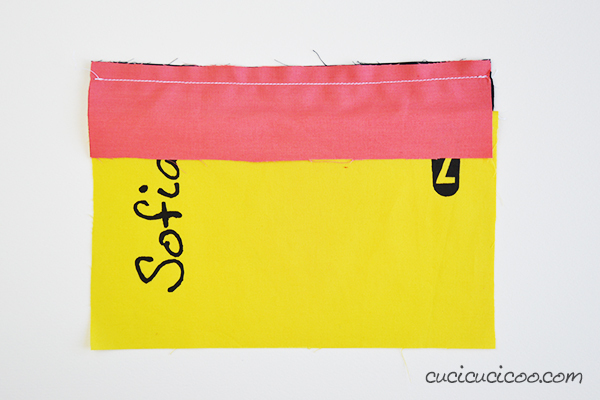 I haven’t gotten to bias tape in this course yet, so if you don’t know how to do that, just trim the edges to even off all the layers and sew around with a zig zag stitch. If you have a serger, you can trim and sew at the same time, which is what I did. Do this on both tube ends. 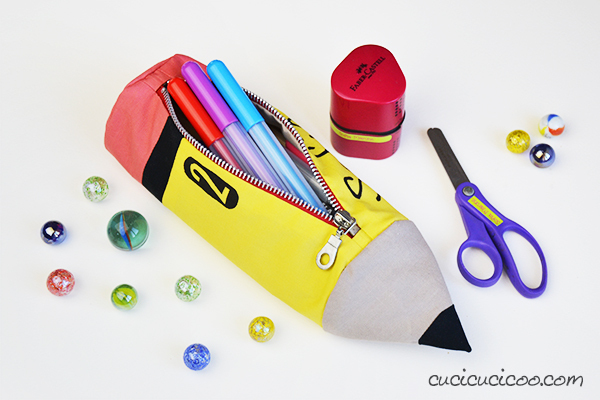 Flip it right side out through the opened zipper, and look at what an adorable pencil pouch you’ve made! The fabric will probably be wrinkled after turning it around so much, so iron it the best you can. 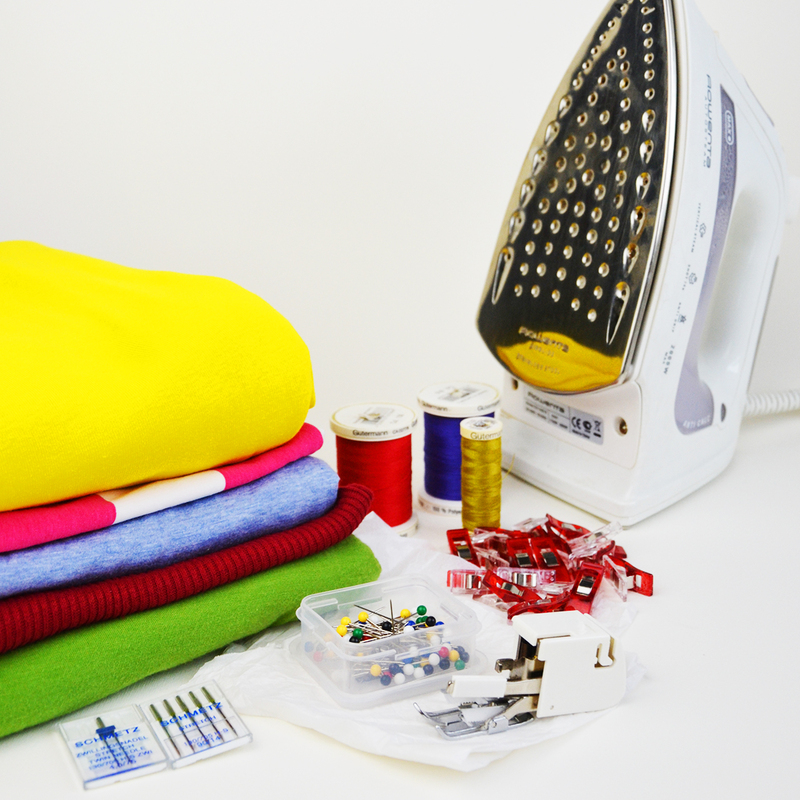 You can stuff a small towel or rag inside to iron it, or use one of those mini ironing boards that are meant for ironing shirt sleeves. It looks just like one of those #2 pencils that everyone in the United States has used for machine-corrected tests! But much cuter and less stress-inducing, right?! Haha! And kids just love having their names on their things! 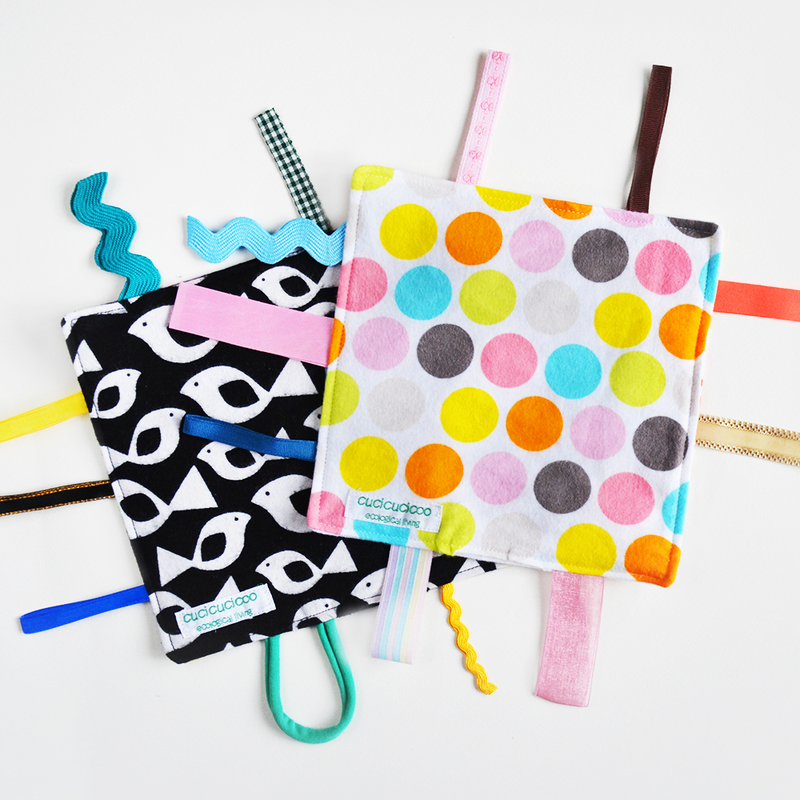 They’ll be so happy to bring all their pens and pencils and markers to school in their own personalized pencil-shaped pencil pouch! Do you have a kid’s birthday or some other special occasion coming up? 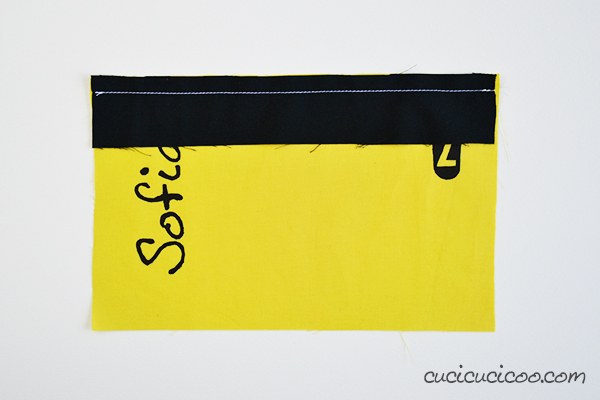 Why not sew him one of these, personalize it with his name, and fill it with fun materials for drawing and creating? He’d love it! 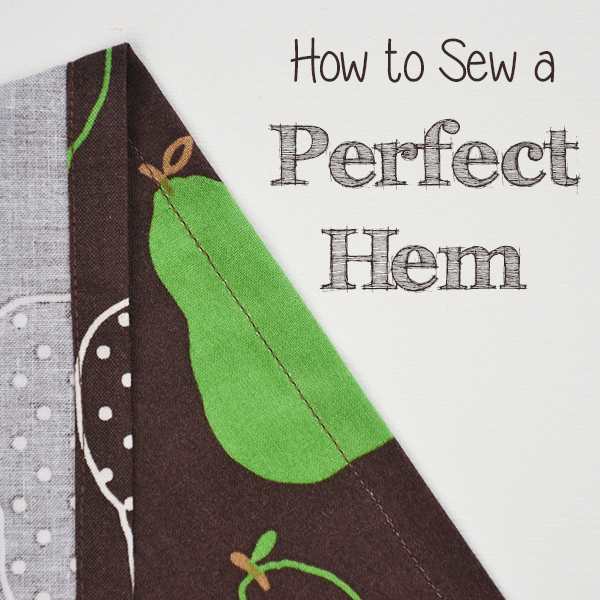 Or heck… just make one for yourself! You deserve it! 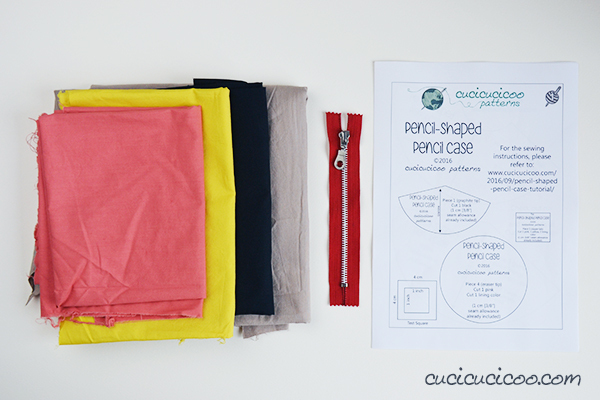 This pencil shaped pencil case tutorial and pattern are part of the syllabus of Cucicucicoo’s beginner’s sewing course! 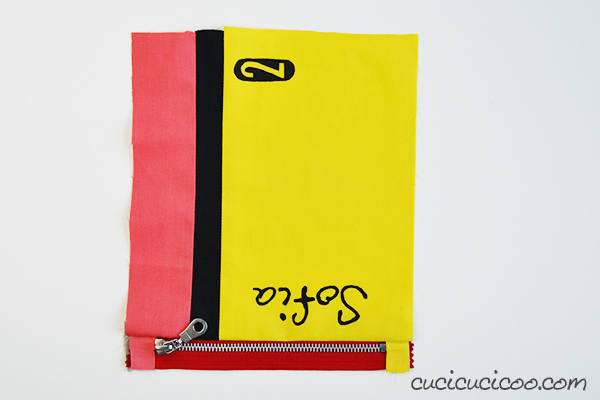 Don’t forget to share pictures of your work on Facebook or the Cucicucicoo Creations Flickr Group! Complimenti anche per il tutorial. Sempre precisissimo. Ci provo sempre a fare le spiegazioni più precise possibili, quindi mi fa molto piacere! 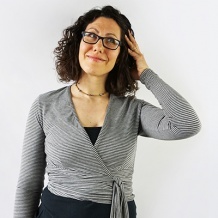 Grazie Carla! 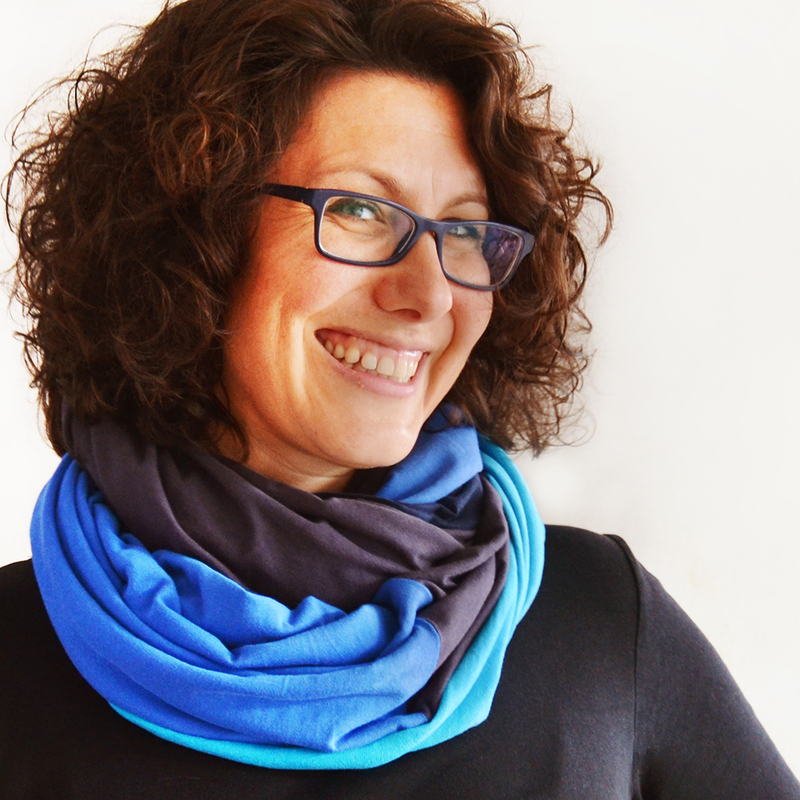 Grazie Lisa per questo bellissimo progetto. Le tue foto “parlano” da sole. Io che sono lenta e imbranata a capire le spiegazioni, trovo invece molto chiare e facili le tue. Ti seguo con interesse e piacere. Questa sì che è una bella soddisfazione per me, Ivana! 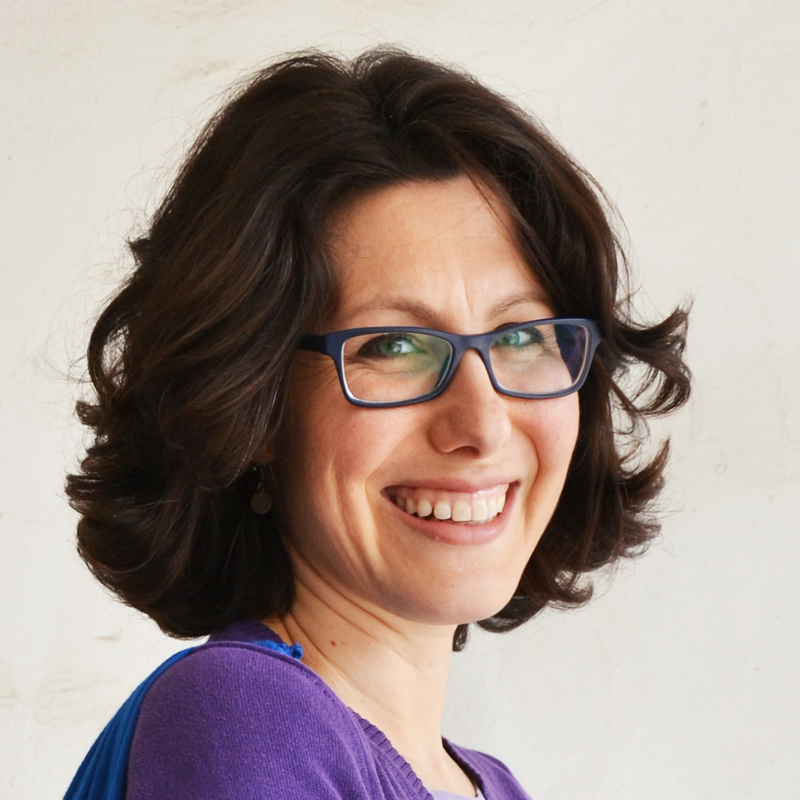 Sono stata insegnante per parecchi anni, soprattutto per principianti, quindi ci tengo a cercare di rendere le spiegazioni chiare! Sono contentissima che ti piaccia, Rosa! Love the shape of your pencil case! Hi Lisa, I’m showcasing your fab pencil case today, in a separate blog post… and I’ve added it to my Christmas ‘To Do’ list. So glad you like it, Jenya! Ciao e complimenti! Mi sono iscritta alla newsletter ma non ho ricevuto la mail per scaricare il cartamodello. Quanto tempo passa dall’iscrizione prima che possa avere il cartamodello da stampare? Grazie!! bellissimo!!!!! ti ho scoperto da poco, che lavori stupendii e sempre originali! ..mi sono appena iscritta alla newsletter! come posso fare per ricevere il cartamodello dell’astuccio?? grazie!! Mi sono iscritta alla newslwtter ma ho mi fa scaricare il cartamodello sulla shopper bag, avendo una bimba piccola a me interesserebbe l’astuccio a forma di matita. Grazie mille…i tutorial migliori che ho trovato sul web. Ciao Vera, che bello che il video sul punto invisibile ti è stato così utile! solo che non riesco a scaricare il tutorial, e nemmeno quello della shopper mi puoi aiutare ? This is so cute, what a perfect gift for a child! Thank you so much for linking up to Funtastic Friday! Thanks for stopping by, Kimm! I did subscribe to the news letter to get the pattern for the pencil case. But cant get the pattern. Please help. Hi, Lizelle! Thanks for signing up! 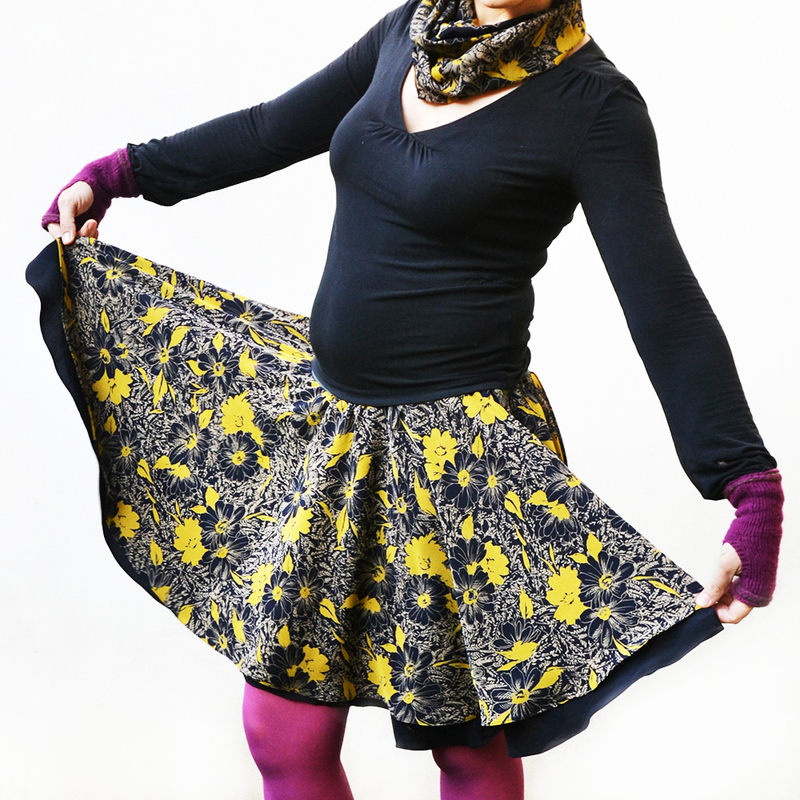 I’ve checked and the welcome email with the links to download the free patterns did get sent to you. Can you check your spam? If you can’t find it, write to me privately at lisa (@) cucicucicoo.com so I can email you everything! Hi. Thanks for the free pattern. 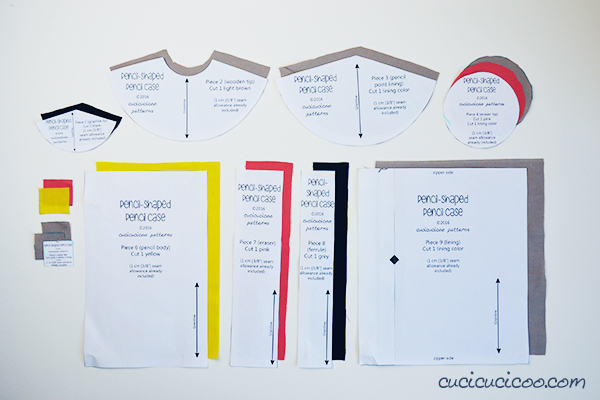 I’m just a little bit confused because the lining measurements printed do not seem to match? It says 20cm by 23cm but when I measure I only get 23cm by 16.5cm. I did get the scale set to 100% when I printed and everything else matches except this one. Could you please help me? Confusion reigns on my end. 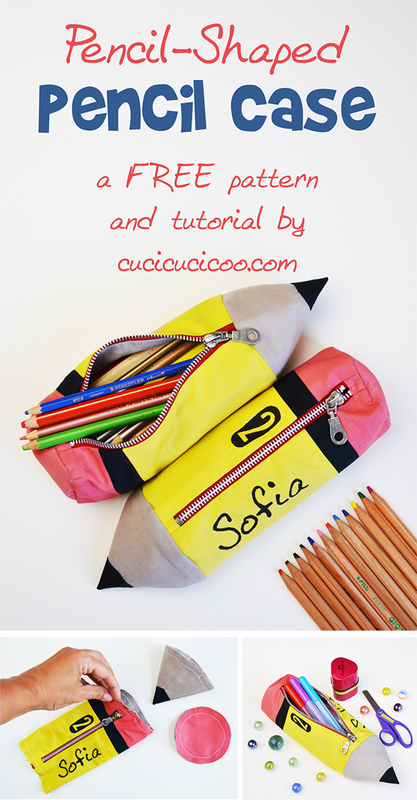 Learned about your pencil pouch tutorial from Lorelei Jayne newsletter. I followed your directions to sign up for the newsletter but the free pattern is not the pencil case. Did I misunderstand the directions? So I signed up and got the confirmation email, pasted the address provided into browser as instructed…but the patterns didn’t show up. Spent a good bit of time back and forth trying, but nothing happens. What can I do? Hi, Dolores, I think what you clicked on was the activation email. That’s great, and you’re signed up! 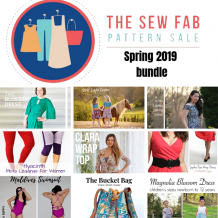 Now check your email again, because right after that you got sent a confirmation email with all the links for downloading the free patterns. If you can’t find it, write to me privately (lisa @ cucicucicoo . com) and I’ll help you out! Noooo ma è meraviglioso! Un astuccio a forma di matita e per di più personalizzato! i can’t find the pdf pattern. can i have it please?